The holidays are coming up, the hottest gifts these days are gadgets and with an ever growing tablet market it’s going to be the top gift this holiday season. 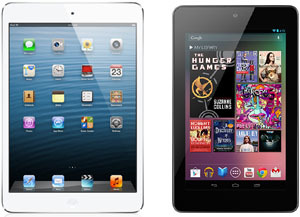 It seems the two top contenders in the tablet market for this upcoming holiday season is Google’s Nexus 7 and Apple’s iPad mini. Both of these devices became instant hits when they were released to the world. The Nexus 7 has a couple month advantage on the iPad mini which just came out. It already seems though, the iPad mini is gaining the market share in the 7-inch tablet market which the Nexus 7 dominates that market place. I happen to have my hands on both devices and want to give those who are on the edge of buying one of the two my opinion on both of the products. Both tablets have similar specs when comparing the internal hardware with each one besting the other in certain areas. For example, the Nexus 7 has a slightly better screen resolution while the iPad mini has better sound quality. The Nexus 7 has double the RAM but the iPad mini has double the storage comparing base-line models (8GB vs 16GB). The iPad mini has a slightly more powerful processor over NVIDIA’s Tegra 3 processor. So you can see that overall they even themselves out when looking at specs and it all comes down to user preference. You could have the fastest and most powerful processor in the planet in a tablet, have the most RAM and lots of storage space. It’s nothing without the software and the user experience you may want from a device. One of the main reasons why I switched to Mac was simplified user experience and the unified hardware and software caused no hassles for me when I needed something to just work. Although the same can be said for Android and its user experience when looking at it, I liked Android over iOS because of the open-source architecture that let people develop apps and freely create apps without the rigorous process of approval. It all comes down to the user experience that you want to have. The bottom line is what you want from a tablet. I cannot tell you which tablet to get or which one is better because it comes down to user opinion and what kind of experience with your tablet. The Nexus 7 is great for those who like open-source and the iPad mini is great for those who want a unified user experience throughout all of Apple’s products.